When I started texting coffee shops from Wroclaw to let them know I wanted to step by, I happened to receive two coincidently similar messages: “Bristol? I’ve lived in Bristol”! Let’s start with Targowa though. Patryk, another Bristol enthusiast, owner of Rozrusznik, is a friend of Filip, Targowa man. This could be the story of so many immigrants in the UK, or Bristol in particular. City that, being dynamic and friendly, became a serious receptor of immigrants. A lot of people know Filip – after winning the World Aeropress Championship, he has become a vindication of Polish quality coffee. Probably as much as Coffee Proficiency. How many times have we heard Polish coffee is incredible? Few? Never? What’s the reason? Well, not because of the the poor quality, it’s the lack of visibility to blame. We’ve mentioned Coffee Proficiency, in my humble opinion, one of the best roasteries in Europe. 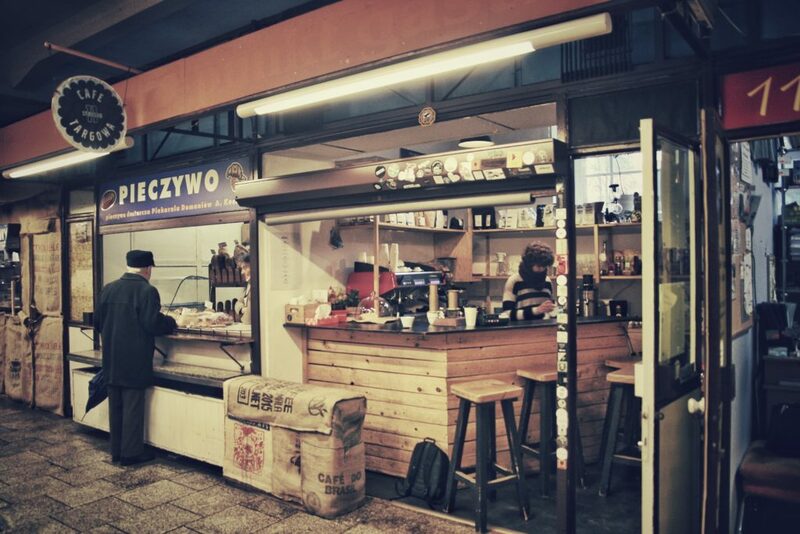 Now, Filip makes another reason for the coffee world to put their eyes on Poland. His victory was a necessary mean to defence a great Polish coffee culture, and for other countries to hear. Nevertheless, this is the story of my visit in Targowa. 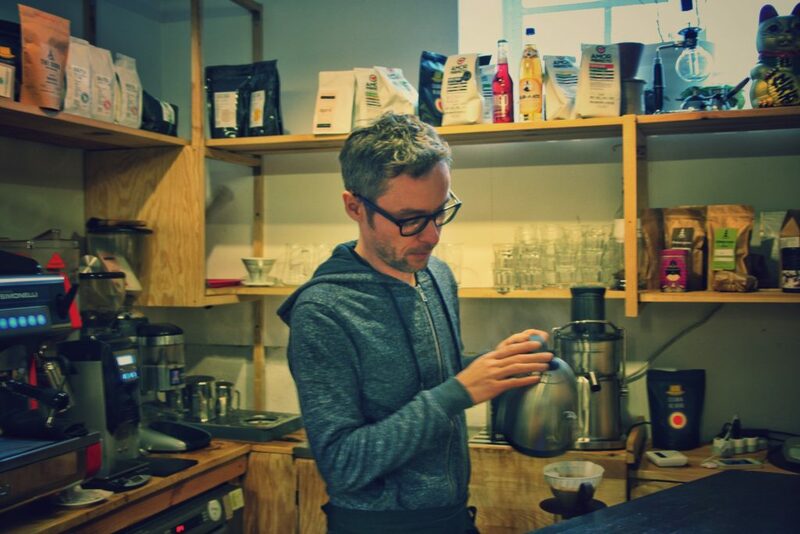 After Filip’s message, my curiosity raised high because of two obvious reasons: he lived in Bristol in time when a city had only just begun tasting speciality coffee and Boston Tea Party had had its birth. And secondly – how many times does the chance of being served an aeropress by an aeropress world champion occur in one’s lifetime? Not that I am the greatest fan of aeropress, I’d rather have pour-overs, but the honours had to be made. I left Kawalerka and my new friends behind and turned my steps towards the other side of the Oder. Running in circles around Targowa, I discovered the building was in fact a covert market. Ten-minutes-of-my-life-wasted later, I stepped inside the market and the first thing I see is a milk bar. Milk Bars are the relics from the Soviet past, still to be found in some Polish cities. They are particularly (ugly) looking, cheap places to eat home-cooked, traditional, low-budget meals. People there love it because of their sentimental souls, longing for what’s lost – cosiness, easiness, youth… The rest of the market looked more familiar to me, closer to Italian style: butchers, cheesemongers and bakeries. Probably still immersed in trying to figure out the meaning of the untranslated boards of my Milk Bar, I was again circling around the market corridors. I didn’t realise that Cafe Targowa’s design resembled so much the stage from a Coffee Festival, small, pushed on the side. Coffee bags filling every corner of the shop, coffees from Poland and other European countries queuing one next to another, ordered in rows and tightly packed on every shelve. Soldiers, ready to shoot you with flavour. 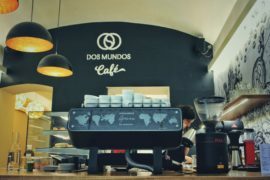 My love for espresso has been betrayed again – accept my apologies little (Nuova Simonelli) Aurelia, but I had to try the new Colombian from Czarny Deszcz, famously brewed on the World Championship. While talking to a Colombian-German guy discovering the wonders of espresso without sugar, Filip arrived. With him, from one topic we would jump to another, and yet the end of our exchange was nowhere to be seen. His Bristol memories were inevitably woven into our conversation. Stories connecting both countries in a thick quilt of his past. I wonder, how many of them told and listened to here in Wroclaw, consist of nostalgia, some quite longing for Bristol. I say goodbye, reminding him Bristol is still calling. 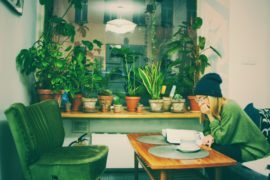 Like to a Milk Bar, come over sometimes, for the old sentiments, and for the new – the best coffee shops in the South West that his Bristol memories lack. I didn’t know much about coffee, just basic knowledge. The goal was to serve the best coffee I could make back then. And it was not easy with the equipment I had. But day by day, month by month I knew more about coffee and was able to brew it better and invest in better equipment. I believe my coffee is better nowadays, there has been a significant improvement. 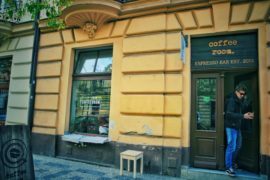 More shops are using specialty coffee now in Poland and the coffee scene is alive and eve growing. I am really curious about what the future will bring us. However I see Cafe Targowa staying where it is, that is what I hope. Targowa should be focused on making the best coffee possible along with immaculate customer service. MEET THE BARISTA… FILIP K.
I just wanted to learn how to make good coffee and there was pretty much only bad coffee around here. HOW WAS YOUR FIRST DAY AT TARGOWA? Well, that was a strange day. 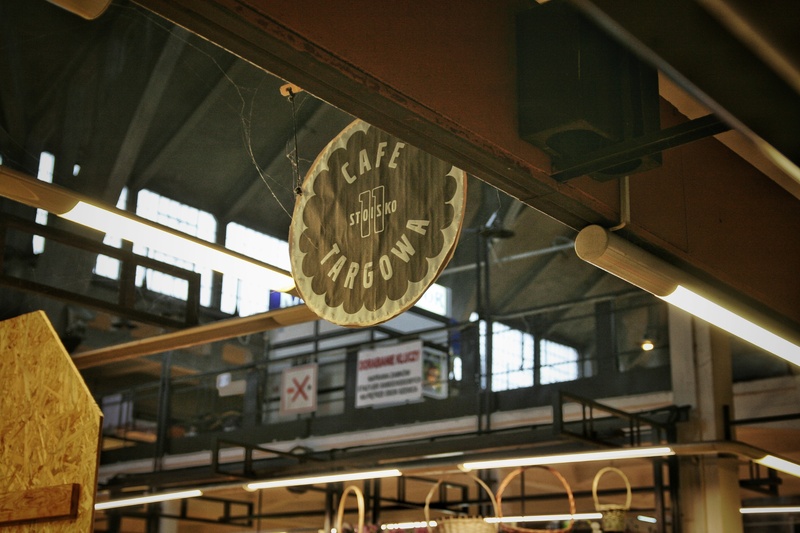 I was happy to open a cafe in this amazing area, the Targowa Market Hall, but at the same time I felt uncertain about the viability of my business and its success. Opening day was fun though as many friends came and it took the attention of people who were passing by the market. WHAT IS TARGOWA FOR YOU? I spend half of my day there and that is quite a lot. For me everything started there. I’m really happy that I managed to make it a business and sort of a coffee destination in Wrocław. Regarding to the bad day, I can remember when I just opened. One day I only sold 4 coffees. I wasn’t really happy about this cold, winter day, but I decided to close early and go for a beer 🙂 One good day? For me every day is a good day. I really enjoy working as a barista! 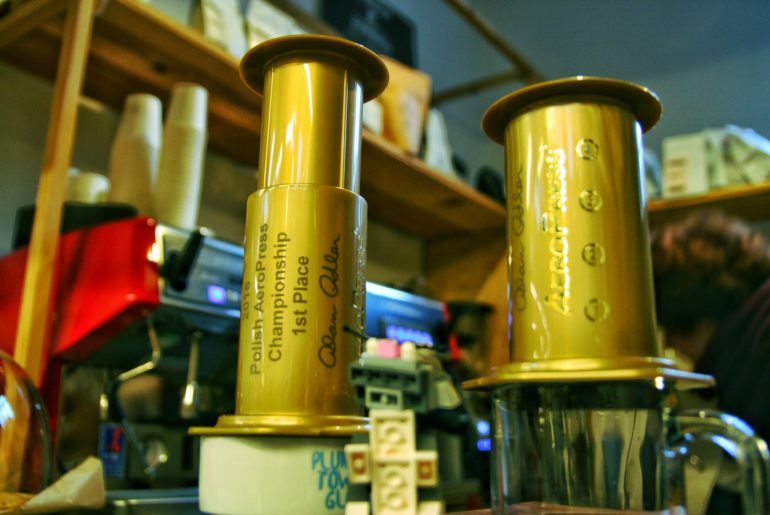 WHY DID YOU DECIDE TO COMPETE IN THE AEROPRESS CHAMPIONSHIP? This is the type of competition that everyone can enjoy. It’s a chance to meet friends and have a good time. In the mean time you compete. Every competition is a different experience. The Aeropress Competition taught me something fundamental, at the end of the day only one thing matters – the taste of your coffee. Rotating Roasters offer from all around Europe. ESPRESSO: One Blends and One Single Origin. COFFEE MACHINE: Two Groups Nuova Simonella Aurelia. GRINDERS: Fiorenzato f64evo and Casadio Enea for Espresso and Mahlkonig Kenya for Filter. They are waiting for the new Baratza Sette 270w .